Posted by Marissa Russell on December 1, 2018 in Lifestyles. Since coming to college, Ferris welding engineering junior Jacob Balogh’s fitness and nutrition have increased dramatically. “I wrestled my whole life, so I was always nutritious and worked out, but coming here in this new Rec Center is pretty awesome,” Balogh said. Aside from having a rest day every two weeks, Balogh spends an hour and a half to two hours every day doing his workout routines. These routines focus on each muscle group and change every couple of months to keep things interesting. 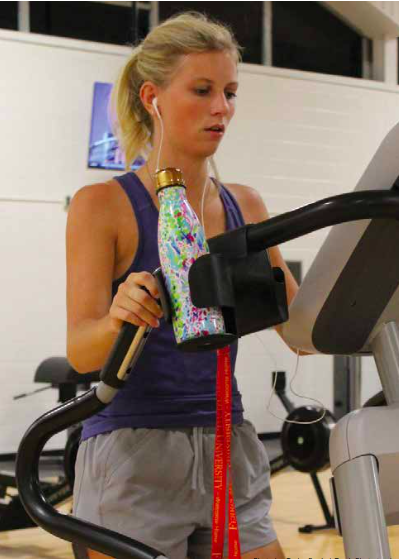 Some students visit the Student Recreation Centre (Rec) to stay fit, but Ferris nutrition and food service management junior Patricia Oyler focuses more of her attention on the nutrition side of health. “Diabetes runs in my family, and being hypoglycemic, I need to make sure I’m getting enough sugar each day so that I don’t pass out,” Oyler said. Ensuring she eats three meals a day, Oyler plans her meals out a week in advance, using this time to make sure she includes all the protein and other nutrients she needs to stay healthy. Oyler eats about 80 percent healthy foods on average. As Thanksgiving comes to an end, and to help students stay healthy, there will be a Diet and Fitness event where students will be able to learn about the importance of a healthy diet and fitness lifestyle. The event is hosted by members of the Black Leaders Aspiring for Critical Knowledge (BLACK) organization. The Diet and Fitness event will take place 5 to 7 p.m. Thursday, Nov. 29, and 5 to 7 p.m. Friday, Nov. 30. The first day will be about nutrition and will be held in University Center room 213, while the second day will be held at the Rec. During this two-day event, students will learn how to have a healthy diet on the go and how tond good workout partners to help each other stay in shape. For more information on the Diet and Fitness event, contact Williamson at willir47@nullferris.edu or visit the Ferris calendar at calendar.ferris.edu.